Please join us at Armitage Park on March 5 from 9-12 for a FREE Sage Spey/switch casting day. Our host for the day is the infamous Sage/Rio Representative George Cook (guy in the pic). 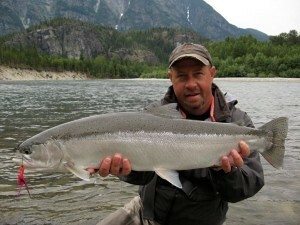 George will be in town to answer questions and demonstrate the latest rod and line innovations in the industry. George will have Spey/Switch rods strung up with the latest lines from Rio and you are invited to pick one up and huck it! This is an excellent time for us to cast and ask. Many times fly lines and rods for different applications can be confusing. Here is an opportunity to get all of your questions answered from one of most knowledgeable, and greatest casters in the fly fishing industry. If you plan to participate and not just observe, you should bring boots and waders. Again, we will be at Armitage Park, March 5, from 9am-12 noon, under the I-5 Bridge. Hope to see you there! This entry was posted in Classes and Instruction, Fly Fishing Gear Review, Oregon Fly Fishing Clubs and Events, Shop Sales and Specials. Bookmark the permalink.